Welcome to the all new JimMoran.org campaign website! 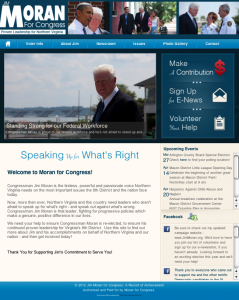 Built on open-source Joomla!’s platform, the new website for local Congressman Jim Moran’s campaign website not only offers visitors a user-friendly experience, but also boasts new features, such as an events stream, easy access to the opportunity to volunteer and donate, updated photo galleries, and a friendly Facebook stream that keeps website visitors updated on his social network happenings. Designed and developed by Alexandria-based web agency, Web Development Group, the new campaign site maintains the traditional campaign blue and white scheme for Jim Moran. Incorporated into that traditional color theme, the most obvious new feature of the new site is its ease of use, prominent throughout the site with a streamlined homepage, blog-styled news, and user-friendly navigation which is accessible throughout the website. Learn more about the new campaign site for Jim Moran by visiting it at http://jimmoran.org, or give us a call and we can discuss how we can make your next project larger than life!